When Shian Graham nestled herself at the back in the sea of graduates at Cambridge High School’s recent graduation on July 5, 2017, tears flowed freely down her cheeks. Perhaps she was crying because just last October, she was diagnosed with Acute Myeloid Leukemia, and was given a 50/50 chance to live. Or perhaps it was because at just 16 years old, she lost all her hair during chemotherapy, suffered, but managed to beat the cancer, returning to her beloved school as their Deputy Head Girl and Top Student, and on graduation, as their co-Valedictorian. The truth? Young Graham was crying because despite her accolades and extenuating circumstances, she was denied the privilege of partaking in her graduation ceremony because she opted to wear braids – an option she considered unavoidable due to her condition, but one her graduation coordinators were not willing to overlook. Graham, who was originally a student of Edwin Allen High, was transferred to Cambridge High School in January of 2015, and expressed to this reporter that she was “very excited” at the prospect of being a member of the school, and “appreciated it so much.” And, although the youngster eventually cemented herself as one of the school’s top academic performers, she initially struggled to find her footing after starting the institution in Grade 9. 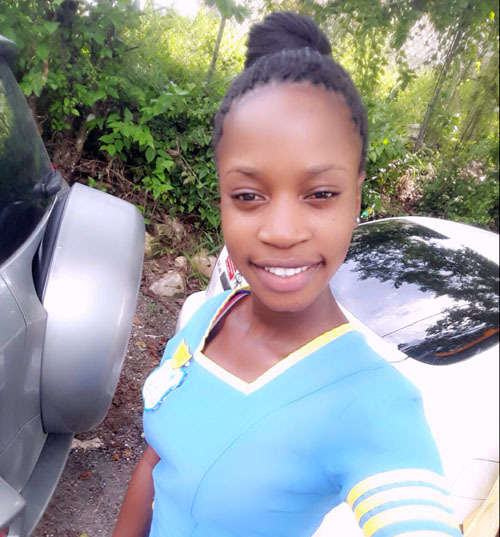 After comfortably settling in, however, the co-valedictorian-to-be had taken CXC Mathematics in Grade 10, earning herself a Grade 2 in that sitting. “Shian is brilliant,” Sophia Black-Hines, Shian’s mother, said when she sat down for an interview with the Western Mirror. “She would always spend time going through her school work, and would always help her little sister at nights, so much so that her sister ended up making the Principal’s Honour Roll at her school,” Black-Hines added of the now distraught teenager, who feels like she has been robbed of a once-in-a-lifetime experience. “Honestly,” Shian’s mother further added, “for most of the things I’ve learnt, Shian was the one who taught me – that’s how good she is.” Mrs. Black-Hines did not spare her emotions, alleging that the actions taken by the teacher on Shian, who was an exemplary student, seemed to have been maliciously fueled. “How else can I look at this? 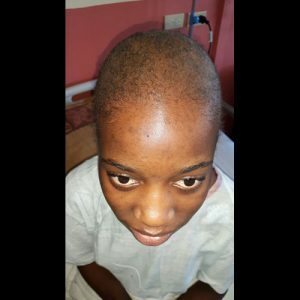 It was just one day, and because of her circumstances, Shian had to get her hair done that way. Why would they simply deny her like that?” The disgruntled Black-Hines asked, before the interjection of Christopher Hines, Shian’s (step)father. After being away from his daughter, and not getting the chance to physically be there with her as she battled through chemotherapy, Hines was scheduled for his vacation leave in April, and was anxious to come home to see her. However, Shian stopped him. “Daddy, please don’t take your vacation leave yet. If you take it now, you won’t be able to come to my graduation in July,” Hines recalls of that tough conversation he had with his daughter. And while it was difficult for him to stay away for that long, Hines honoured his daughter’s wishes, and decided to wait until her graduation to take his leave. As it turns out, however, Hines’ trip appears to have been in vain, as Shian, though given her certificate after the ceremony, did not get to walk across that stage for all who came to support her, especially her father. “I begged him to make that sacrifice, but all he got in return for his sacrifice was embarrassment and disappointment,” the now 17-year-old related, who celebrated her birthday last month. Similar sentiments are expressed by a number of Shian’s family members, who were obviously angered by what they believed to be insensitivity and a lack of proper judgment on the part of the teacher who stopped her. In a voice note to the teacher, one of Shian’s aunts, a social worker in the USA, had this to say: “What was your real purpose of not allowing Shian to participate? Imagine, Shian has gone through so much for the past couple of months, yet you stopped her from enjoying this one day? Well, let me tell you something – I am going to take this to the Ministry of Education because what you did to that young lady was very wrong.” The voice note went on to criticize the actions of the teacher as discriminatory, and described the result as coming from an education system that lacks reasonable flexibility. In light of those allegations, the Western Mirror contacted the Cambridge High School, and spoke to its Principal, Mavis Hamilton. Ms. Hamilton confirmed that such events did unfold on the day in question, July 5, and that the actions taken by the graduation coordinator were in no way personally motivated, but came from a place of fairness to all students, and in respect of the school’s explicitly stated rules. “Graham reached the graduation ceremony late, and under those circumstances, we could have enforced the rules and require that she not be admitted to the ceremony, but we didn’t.” She further explained that with Graham being the school’s standard bearer, it would have sent a dangerous message to girls at the ceremony who were previously reprimanded and had their extensions removed, if Graham was allowed in the ceremony as she was. Principal Hamilton further added that the parents of Graham did not see themselves in the wrong, and did not express any respect for the rules the institution had set, concluding that she will always stand up for what is right, despite intimidation, not what the majority will vote for. Shian Graham’s family is intent on getting the matter investigated, and have threatened legal action, should justice elude them. What’s more important? Shouldn’t she be rewarded for her intelligence? None of the other students should even have been reprimanded for this, far less her, given her struggle. Plus let’s remember this issue is rooted in white men’s efforts to control black people. As recent events show, no matter how you dress up, even that won’t create opportunities in the system unless you want to be working for someone in a menial job your whole life. Black people must learn from the Bill Gates experience and stop forcing artificial standards on our kids. They want us compliant and obedient – dress like this, wear your hair like that, sit this way, walk this way. That’s really how they control us. Being polite and dressing white certainly hasn’t stopped us from getting killed like an animal by the white system. We let soooooo much fuckery pass under the guise of manners, good breeding, civility and hospitality. We still toeing the same old line waiting on them to move it for us!! Are we referring to the same Cambridge High I worked at for 4 years. At the time we were very liberal even having Rastafarian children attending class because Rev Chris Anderson was more interested in education of children than their social or cultural background. This was a school which embraced diverse beliefs We had the JTA and the NUDT, We had people of different political beliefs . The importance of archaic rules such as braiding of the hair seems to be paramount than the welfare of a girl who has suffered so much.